Want to make some awesome breaded chicken wings for your next party or get together but don’t want to have to drag out the deep fryer or fill your house with obnoxious deep fryer smell? My Air Fried Breaded Chicken Wings give you all the wonderful flavor without any of the hassle. These Air Fried Breaded Chicken Wings are crispy, delicious and super tender. They’re sure to be the hit of the party! 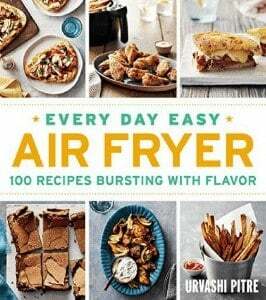 When it comes to cooking appetizers and party foods with ease, the Air Fryer reigns supreme. It makes finger foods just a crispy as a deep fryer without soaking your food in fattening oils! Not to mention the Air Fryer won’t fill your house with an overbearing deep fried oil smell. My Air Fried Breaded Chicken Wings recipe is perfect for your next sports event, party, Netflix binge session or even as a full-on meal! It’s a great comfort food that is made healthier and easier with your Air Fryer. LOOKING FOR SOME AIR FRIED WINGS WITH A LITTLE MORE KICK BUT FEWER CARBS? CHECK OUT MY KETO AIR FRYER KOREAN CHICKEN WINGS! Want delicious fried chicken wings without all the grease of the deep fryer? Make these Air Fried Breaded Chicken Wings with the help of your Air Fryer! Place chicken wings in a large bowl. Pour in the oil and then toss to coat the wings well. In a separate bowl, add dry ingredients and whisk until combined. One at a time, place oiled wings in the dry mixture and coat with breading, then place each wing on in the air fryer basket. Set your airfryer to 400F and cook for 20 minutes flipping half way through. Use a meat thermometer to ensure the chicken wings have reached an internal temperature of 145F, and the breading is brown and crunchy before serving. Which air fryer do you use, please?